It’s a good, sometimes funny movie, but has a predictable plot, and isn’t as creative as one might have hoped for. There’s some worthwhile humor here, from time to time, but for the most part what we have is a cliche riddled, pretty dopey movie. How else to explain a film about four women going on a trip together, where only one of them really gets a storyline. That one is Ryan, the girl who is hosting a show down in New Orleans and brings her friends along. The entire movie seems to hinge on her relationship with her husband. Is her husband cheating on her? The friends are on a mission to find out, as they go from place to place trying to deal with the woman who is supposedly the mistress. The only other character who gets anything close to a plot is Lisa (Jada Pinket Smith,) and her plot is about not being able to handle the package of the guy she’s with. How interesting. This movie is no Bridesmaids. Tiffany Hadish, who plays the crazy, wild card, Dina, is really the only redeemable thing about the film. 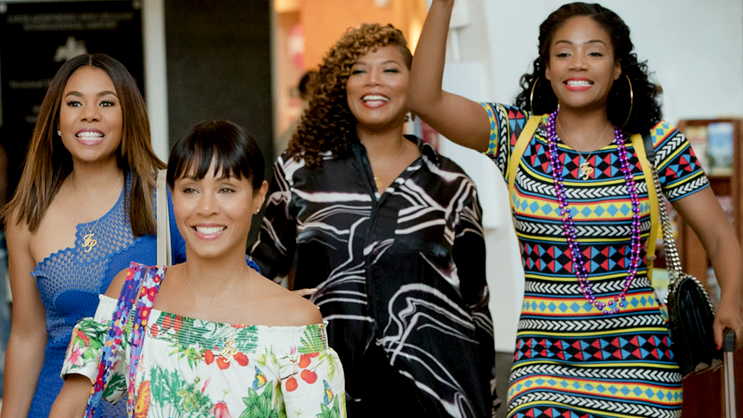 Girls Trip is an okay movie. It’s got a decent plot and some funny moments, but it’s not something super creative or hilarious. And yet for some reason, the movie-going public treated the movie like it was. This was one of the most talked about movies of 2017, based on popular audience reaction. Tiffany Hadish was the breakout star of the year, (although that is arguable with other big breakouts like Daniel Kalua from Get Out and Timothy Shalome from Call Me By Your Name.) 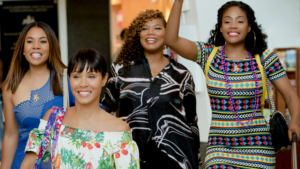 But considering that Hadish has already hosted Saturday Night Live, since this movie came out, and those other two can easily fall by the wayside if their next projects aren’t so great, (Jennifer Hudson, the guy from The Artist,) it seems like she is the biggest breakout of the year. And Hadish is pretty funny, and deserves that honor. But the movie itself, is just okay. It is enjoyable and good, but far from anything great. The movie wants to be The Hangover meets Bridesmaids, only both of those films were hilarious and groundbreaking in terms of originality. 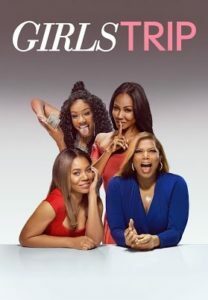 This movie may be groundbreaking in terms of having four black women be the stars, (although really, that’s been done before, going bak to movies like Queen Latifah’s Set It Off,) but it most is most certainly not original. What we have here is a film about four friends who have kind of lost touch since the good old days and gone their separate ways in life. And through a trip they decide to take, to New Orleans, they all end up coming back together. The trip is not out of nowhere or anything. It is a perk for one of the women, Ryan (Regina Hall,) who is hosting the Essence Music Festival. And she brings her old crew (which used to dub themselves the Flossy Posse,) down there with her. We meet the members of this crew in their individual lives at the start of the film. There’s, Haddish playing Dina, the wild card, crazy one. We watch her get fired for assaulting a coworker. Then there’s Lisa (Jada Pinkett Smith,) the quiet, reserved one. She’s a divorced mom who hasn’t had a boyfriend in years. Next up is Sasha (Queen Latifah,) an ex-magazine journalist, who now has a struggling blog. And finally there’s Ryan, a sort of Oprah-like self-help guru, the one who gets them all to come on the trip. Ryan’s whole thing is that she has the perfect life with the perfect husband, and wants to teach others how to be just like her. The book she’s out promoting at the start of the movie is called, “You Can Have It All,” and her husband, Stewart, goes on all of the talk shows with her. The problem is, with a book title like this and storyline that puts it all out there in a show off-kind of way at the start, you just know there’s gonna be some trouble in paradise. When a movie starts with its characters so high at the top, there’s only one way for them to go, and that’s down. So we can predict that what’s going on here is one of the following things. Stewart is cheating on Ryan, or they are are both cheating on each other. The movie has some fun with that. Instead of simply being that he’s cheating and the other girls know and have to decide how to tell Ryan, this movie takes that usual plot line out of the way early on. It turns out that Ryan knows he cheated on her in the past, and the two of them are going to couples counseling working on it. The cheating problem is a thing of the past. Or is it? A better movie would have put it to bed early and moved on, never looking back. This one has that storyline keep reoccurring. In fact, in many ways it becomes the central storyline of the movie. So we get scenes like the Gould shoring up to a cooking show where Ryan and Stewart are cooking with the host. The three other girls in the group all get on stage and start cooking, and then guess who also shows up on the stage? The girl who Stewart has been sleeping with. She shows up again with a bunch of friends to have a fistfight with the girls at a bar. And she dominates another storyline about some photos that are going to be made of blog which shows Stewart with her, revealing to the world that Ryan’s perfect life is really a lie. The other character who gets a little bit of a story is Lisa. Her story is simply that she hasn’t had a man in a while. So the girls push her into meeting someone, and she does. Only the guy’s package is a little too big for her and she doesn’t know how to handle it. Yeah, this is actually the story. It’s the kind of reason why this movie has more in common with a Magic Mike film than a Bridesmaids. So Lisa gets some advice (and a demonstration,) from Dina about what she can do with a grapefruit. Let’s just say Dina puts a grapefruit and a banana together and goes to town. It’s the only real sexual scene in the move, and it’s oretty funny, but there should have definitely been more. That’s the other reason why this movie really isn’t that good. It doesn’t take enough chances. If it wants to appeal to the sexual comedy crowd, then it needs more funny sexual situation scenes. Instead, this thing is actually kind of tame. Of the four girls, the only one who really has any kind of wild side is Dina, and she doesn’t meet any guy in the trip. Neither does Sasha. She talks the talk, but doesn’t really walk the walk. Spesking of Sasha, her whole storyline is meant to be a part of Ryan’s thing that she has going on with Stewart. Those pictures that are being sent around to the industry and haven’t gone public yet… we’ll, Sasha gets a hold of them, and there’s the question she faces if whether she should publish them, do give her career a boost, or not, to be a good friend to Ryan. It should be a very quick and simple stortyline, and yet it is dragged out here until it leads to the inevitable… a fight. Only it’s not just Sasha and Ryan fighting, but each of the four girls fighting with the others. This sort of thing is pretty ridiculous. So is the fact that the movie has to resort to an absinthe scene, and act like we’ve never seen this before. There have been so many movies that try this joke about unsuspecting people taking absinthe and hallucinating, from Moulin Rouge to Eurotrip. It’s basucally a time filler when a movie needs to thriw extra scenes in there. And this one does so while trying to shovel us a storyline about a wealthy tycoon meeting with Ryan and her friends while considering her for a job. So Ryan and her friends do idiotic things (like making out with a lamp,) and the tycoon woman continues to not notice and think everything is normal. It’s pretty dopey. And it’s also characteristic of the humor in this movie. Sure, there are times when the movie is kind of likeable and fun, but for the most part, it’s pretty corny.